Relatively flat unincised surface. May have ponds and discontinuous channels or drainage lines. Composed of vertically accreted mud. Sand sheets (floodouts, see below) may form downstream of discontinuous gullies. May comprise organic-rich deposits formed around swampy vegetation. 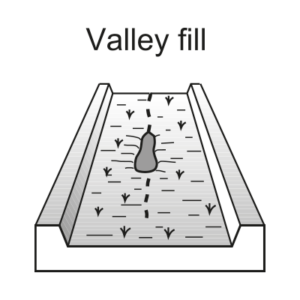 These sediment storage features are typically formed by flows which lose their velocity and competence as they spread over an intact valley floor, and deposit their sediment load. Vertically accreted swamp deposits are derived by trapping of fine-grained suspended load sediments around vegetation. Mud beds may alternate with laterally shifting floodout and sand sheet deposits.